Beautifully engraved certificate from the United Air Lines issued in before 1975. 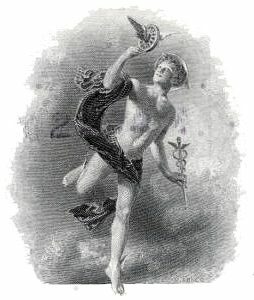 This historic document was printed by the American Banknote Company and has an ornate border around it with a vignette of Mercury holding a flying wheel. This item has the printed signatures of the Company’s President and Secretary and is over 35 years old. 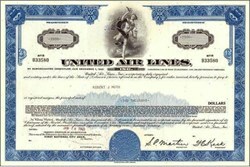 UAL Corporation is the holding company for United Airlines, the largest air carrier in the world. With hubs in Chicago, Denver, Los Angeles, San Francisco and Washington, D.C., and key international gateways in Tokyo, London, Frankfurt, Miami and Toronto, United flies to some 133 destinations in 28 countries. United's 101,950-plus employees worldwide bring people together safely, conveniently and efficiently over 2,300 times a day. United Airlines' customers also enjoy access to more than 815 destinations around the world through Star Alliance, the leading global airline network. United is an industry innovator with customer-service breakthroughs such as Economy PlusSM seating, the United First SuiteSM, Our United CommitmentSM, E-TicketSM service, airport gate readers, The ChariotSM mobile airport podium, United Shuttle, and the introduction of the technologically advanced Boeing 777. United’s Mileage Plus® program, with almost 40 million enrolled members, has been named the best frequent flyer program by Business Traveler International magazine in 1996, 1997, 1998 and 1999. United also leads the way in safety and technological advancements for the aviation industry. The pioneer of systems such as the Enhanced Ground Proximity Warning System (EGPWS), United always focuses on its top value of "safety at all times, in all things."